Dragon Quest has always struggled to find a foothold in the West. Even the oft-mentioned eighth chapter’s sales were mostly bolstered by the inclusion of the first playable demo of Final Fantasy XII (which some would argue is the lesser of the two games, but I would say they’re both stellar, just in different ways). 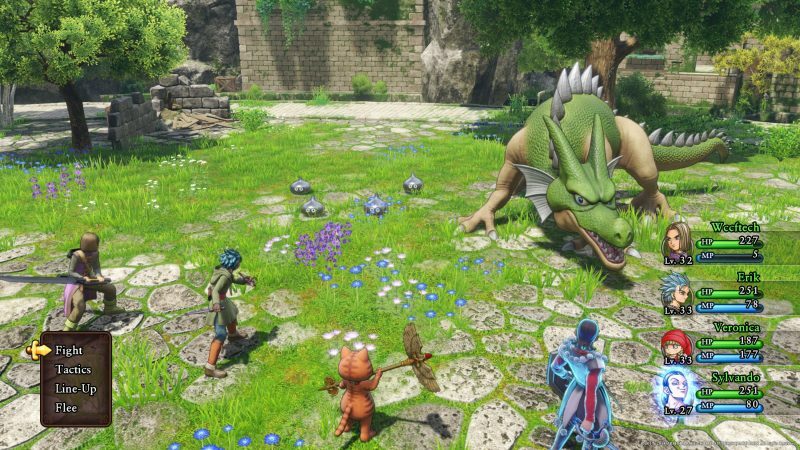 After that, Yuji Horii, creator of Dragon Quest, and his team offered up a handheld adventure for the ninth entry in the series, followed by a Japan-only MMORPG for Dragon Quest X.
It’s been 13 years since a proper installment in the Dragon Quest series has appeared on a home console, and Square-Enix seems to be taking this opportunity to push the series harder than ever on Western audiences. Will their huge hype machine pay off? 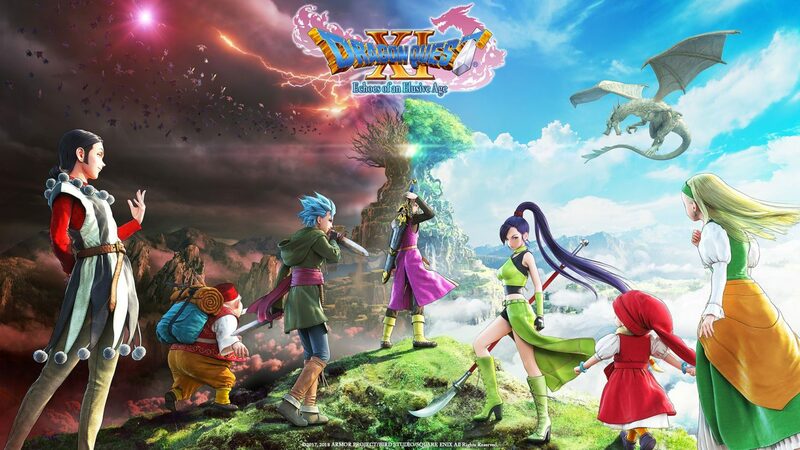 Or is Dragon Quest doomed to be that crazy hit in Japan that most gamers around the world just don’t get? To understand the massive appeal of Dragon Quest in the East, it’s important to look at Japanese society as a whole. For the most part, Japan is a very pack-mentality kind of place–conservative to a fault, a bit old-fashioned, and adverse to change. All of these qualities can easily be ascribed to any entry in the Dragon Quest series. They are traditional, turn-based RPGs, which rely heavily on familiarity and do little in terms of innovation when it comes to gameplay. It was practically considered heresy when the tenth installment was announced as an online-only, pay-to-play, massively multiplayer game, but to anyone who has actually delved into that game, the core gameplay and presentation of the series remains intact–aside from the whole online multiplayer part. Western gamers most likely won’t know any of this, so the closest analogy would be Dragon Quest IX, which was released on a handheld, featured online co-op, and relied on a blank slate of characters for the player to customize instead of introducing a unique cast of characters. But much like the aspects of X, some of these elements have precedence in the series. Dragon Quest III way back on the NES featured blank characters that could be molded in any way the player liked. Also, like X, Dragon Quest IX didn’t stray far in terms of presentation or gameplay. This adherence to tradition is what makes Dragon Quest such a huge hit in Japan. Audiences know, for the most part, what to expect when a new game is released. And shockingly, there’s nothing wrong with that. Not that innovation and pushing the envelope is a bad thing. Especially in the realm of gaming, it’s brought us a lot of great new advancements and interesting new properties. Recently, certain Japanese game developers seem to be catching onto that trend as well (ex. Yoko Taro with Nier Automata, and basically anything by Hideo Kojima–just to cite a couple of examples). However, there’s something to be said about executing a known formula extremely well. And that’s what finally brings us to Dragon Quest XI. So, if you’re expecting some grand reinvention of the JRPG genre when you boot up this game, then you haven’t read the last 522 words of this article. Welcome to the world of Erdrea. With each subsequent game in the series Yuji Horii and company have only been interested in creating the most perfectly executed version of the tried and true JRPG tropes that they pretty much created. It’s not about reinventing the wheel; it’s about smoothing that wheel out until it runs like a dream. And that’s exactly what Dragon Quest XI does. 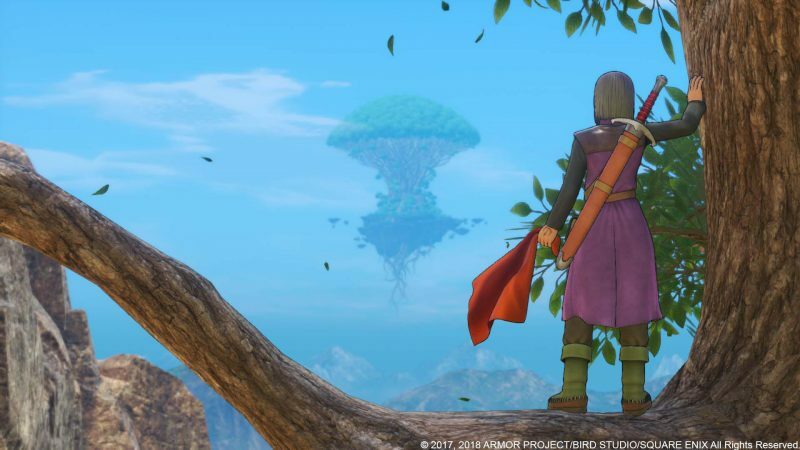 From the graphical presentation to the battle system, the character interactions to the town and dungeon design, all topped off with healthy does of charming atmosphere, everything in Dragon Quest XI is polished until it’s glimmering. The game is built on a solid foundation that plays it safe and doesn’t reach too far outside of its comfort zone. That is the very essence of Dragon Quest. If all of this sounds like something that doesn’t appeal to you, then turn away now, because the next 1590 words aren’t going to convince you otherwise. Our hero. I named him Wexley. The story concerns a young man who is born as a Luminary, a legendary hero that will banish darkness from the world when he comes of age. Of course, bad things happen to him when he’s a child, and bad things happen to him again when the player gains control some umpteen years later. He’s living in a quiet village, climbing a mountain to prove he’s a grown up (as you do), when a sigil on his hand lights up and makes fried chicken out of a giant bird that attacks him and his childhood friend. This sets him on a journey where he finds out about his origins, meets new friends, explores the world, and fights evil. SIDE NOTE: Coincidentally, in Japan there is a dish called karaage that is essentially fried chicken. I’ve noticed many people get a notion to go questing in the world at large whenever they encounter the mere scent of its greasy goodness. Naturally, you meet a cast of quirky characters along the way. A small number of them make up your adventuring party (6 of them to be exact). Your core group of traveling companions are all interesting and play off of each other in fun ways. The best combination in story situations is Sylvando and Veronica, hands down. 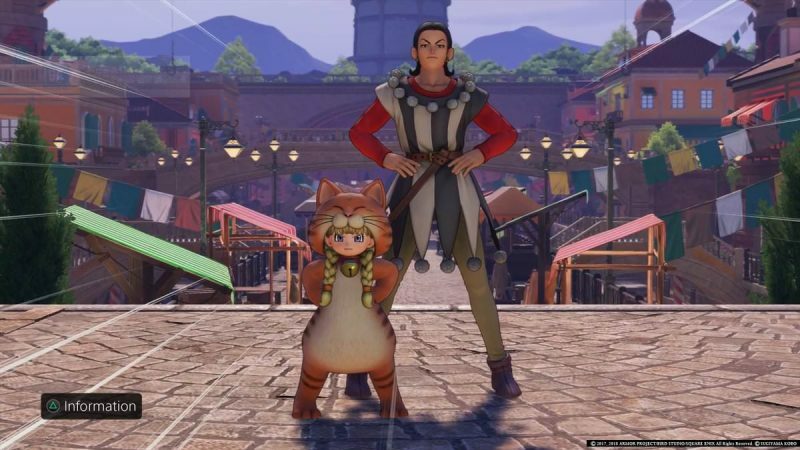 The rest of the quirky cast is scattered around the world in the different towns and villages of Dragon Quest XI. Of course I’m referring to those wacky NPCs. It’s always good to bring along some company on an adventure. One thing that a lot of critics (and even some fans) fail to acknowledge concerning the Dragon Quest series is the power of its writing. 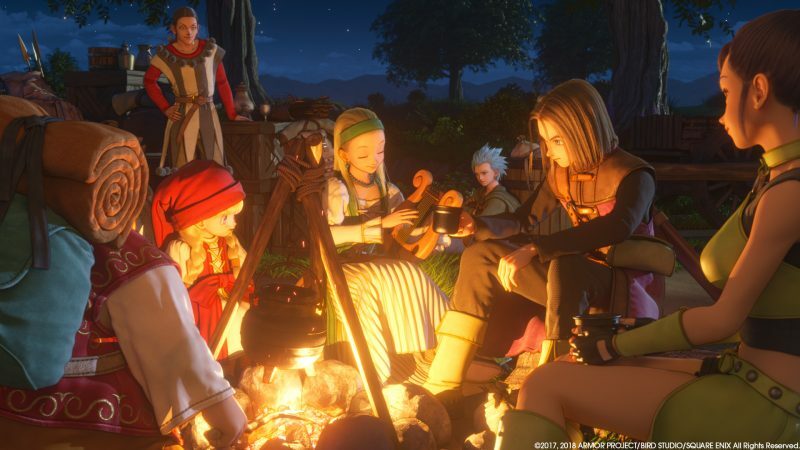 The plots are usually packed with themes and events that have been seen elsewhere in other JRPGs and fantasy stories, but it’s the characters who play out these tropes that give Dragon Quest worlds their emotional heft. 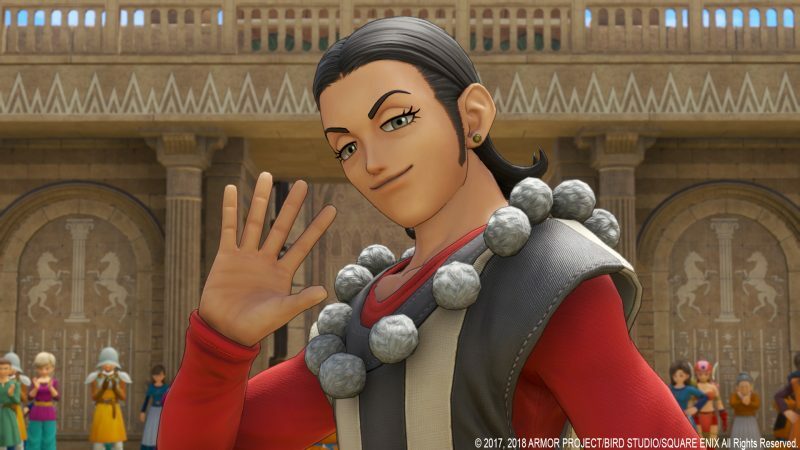 You will never care more about some random NPC in some dumpy backwoods town than you will when you play a Dragon Quest game. The series loves to focus on the small fries and the little inconsequential tales that don’t even seem to make up the greater whole of the story. That means the world is full of depth, but it also means that it requires a bit of patience from the player. You’re not going to get story payoffs immediately. The magic lies in the subtleties, the art of populating the world with interesting people. You will never care more about some random NPC in some dumpy backwoods town than you will when you play a Dragon Quest game. On the note of the writing, fans and critics are also pretty divided on the English translations in the Dragon Quest series. The localization team has a penchant for puns, alliteration, and dialects. You won’t find a game in the series after VIII (including remakes) that doesn’t have these little touches. SIDE NOTE: I think they’re great, and I love some of the thought that has gone into certain aspects of the localization. For example, there’s a hot spring town fairly early in the game where every single character speaks in haiku. That’s insane. Do you know how hard it is to write a haiku? And I mean write a haiku well, not just fudge about with some 5-7-5 syllable nonsense. It’s hard. But every character in that town speaks that way, and there’s like 30 NPCs there. I know I’m going on for a long time about this, but it’s incredibly impressive. The story sways back and forth between these minor character interactions and big story moments. For the most part, it hits the sweet spot in terms of pacing. This is a long game, and it takes its time in the opening hours setting up the story and introducing new places. In fact, it won’t be until about 8-10 hours in when you get a full party of characters and close to 20-25 before you collect your entire crew. From the cute to the fearsome, Dragon Quest games always have an array of unique monsters. Once you get a full set of characters for battle, that’s when the gameplay starts to open up. 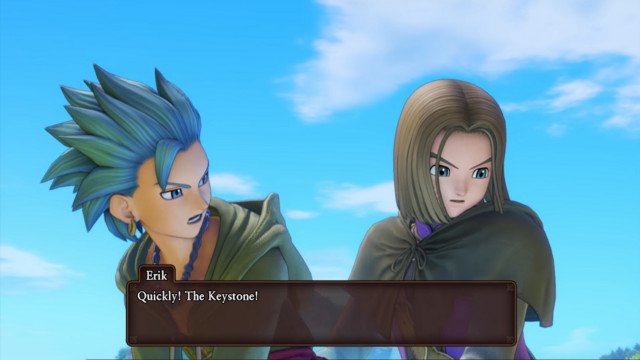 Dragon Quest XI introduces the Pep system. Much like limit breaks in certain Final Fantasy games, at certain times in battle, the characters will enter a Pepped Up state which will increase certain stats depending on the character. Along with the increase to their strengths and defences, they also gain access to Pep Powers which can be used by themselves or in conjunction with other characters. These are powerful abilities that can cause huge damage, inflict status effects, or heal allies, among other things. One downside is there’s no way to predict when a character will pop into Pep. A handy trick though, if you’re attempting to use a Pep Power that requires two specific characters, is to switch one of them out of battle once their Pepped Up and wait for the other character to enter Pep state. The character not used in battle will retain their Pep while on the sidelines. This is also useful if you’re trying to strategize for an upcoming boss fight. Take your time or punish yourself.. Or both! This is here because I love it. Another thing you can do to occupy your time during your adventure is use the Fun-Sized Forge. You gain access to this device fairly early. With it you can craft new weapons, armor, and accessories. It’s a fairly fun mini game, involving hammering out different items. Depending on how well you do in the mini game, you can give items additional boosts to their properties. By making more items and levelling up your crafting skill, you gain different abilities that can help create better equipment. These beefed up items come in handy especially if you’re tackling the game with any of the Draconian Quest handicaps turned on. To add a bit more challenge to the vanilla game (which is admittedly, a bit too easy), there are a list of options that can be turned on when starting a new quest. These include tougher monsters, no fleeing from battle, only being able to use items that you find or craft, not gaining experience from enemies that are weaker than you, and having misfortune follow you throughout your journey (ex. having bad breath and not being able to talk to NPCs, realizing your socks are on inside out during battle and missing a turn, and so on). Any of these can be taken away at a church or priest by requesting Absolution. However, once switched off you cannot turn them back on. I’d recommend starting with at least the stronger monsters options (as mentioned, the vanilla game is a bit too easy). If it becomes too much, you can always absolve it. Some of the English voices grate, but most are high quality. 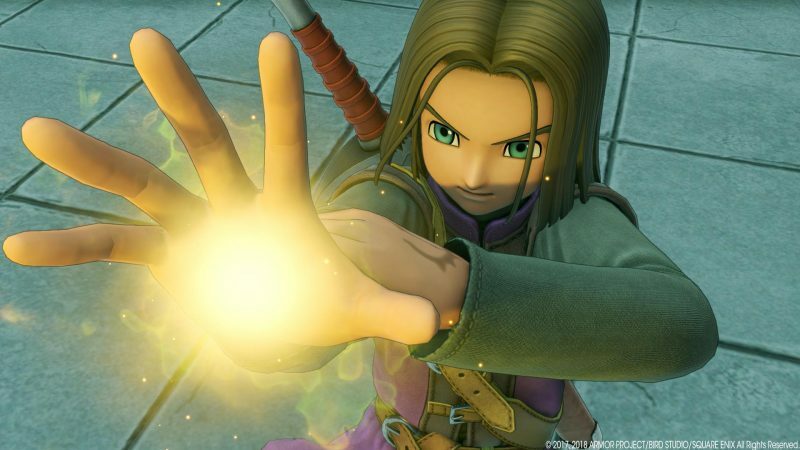 Among other enhancements made to the Western release of Dragon Quest XI, there is now a sprint button, and the visuals have been enhanced. SIDE NOTE: Having played both the Japanese and English versions on a PS4 Pro, I can safely say the texture details, lighting, and shadow effects are all easily apparent in the Western release. Maybe this won’t be as pronounced for players not using a Pro or for those who didn’t play the Japanese original. Suffice it to say, the game looks gorgeous. Also new to the Western release is voice acting. While overall, it’s high quality and some of the performances are quite good, there are a few grating choices, specifically the hero’s childhood friend Gemma right in the beginning of the game. SIDE NOTE: Since I played the Japanese version of the game first, which features no voice acting, I sort of got used to that and had trouble adjusting to voices. I ended up turning them off for the majority of my playthrough of the Western release. I did switch it on now and then just to hear what new characters sounded like when they appeared. Like I said, it’s high quality, but it’s also nice to have the option to switch it off if you’re not liking what you hear. 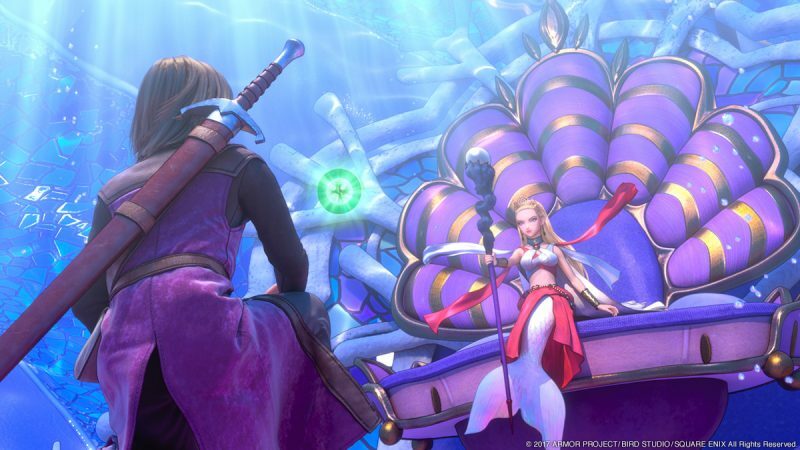 Epic overtures, melancholy ballads, and jaunty tunes make up Dragon Quest XI‘s soundtrack. While discussing sound, we should also touch upon the music. Dragon Quest games have some iconic themes, but for the most part the soundtracks aren’t as highly celebrated as say, the Final Fantasy series. Many of the tracks are memorable. Some of them, like the opening overture, are even standard in Japanese schools! But as mentioned, they’re steeped in tradition and don’t stray too far outside of the box in terms of composition. Having said that, the music is fitting. Sweeping and epic in moments of high action, appropriately subtle when it needs to be. One last point of contention that many critics and fans have complained about is the use of MIDI for music instead of full orchestration. My thoughts are this, the music is well-composed and performed. It doesn’t matter if it’s real instruments or a music program as long as the music itself is good, and Dragon Quest XI has excellent music. Are you a fan of old-school, turn-based RPGs who’s looking for a modern take on these tried and true formulas? If so, Dragon Quest XI is the game for you. It is the purest and most well-made form of this kind of game on the market today. You will not find a more charming, colorful, technically impressive, or highly polished package out there. It’s a long journey that is fantastically executed from beginning to end. From the smallest character interaction to the biggest story moment, Dragon Quest XI is a triumph. Will it be the game that wins over the West to the Dragon Quest legacy? To be honest, probably not. But the faithful have a game to celebrate, and it’s sure to draw in at least a few new fans with its stellar presentation and solid gameplay.